An eight-year-old LeBron James sometimes didn’t attend school because there was no one who could give him a ride. He sometimes skipped class outright, instead playing video games by himself at the ramshackle one-bedroom home in Akron, Ohio, owned by a friend of his mom, who would disappear during the day. Other times, Gloria James and her son were simply too entangled in the task of securing a place to sleep and food to eat that night. “We’ll just skip today,” they’d tell each other. Then another day would rise and fall, and another, with no attendance in class. Ultimately, James skipped nearly 100 days of school as a fourth grader in Akron. He had moved a dozen times in the three-year span between age five and eight, with Gloria struggling on welfare and relying on a network of friends to give them shelter when the rent ran dry. He didn’t play sports. He barely had friends. He lagged on basic reading, writing and math skills. What got James back in school was the stabilizing force of Bruce Kelker, the Pee Wee football coach at James’ elementary school who first discovered his athletic talent. Kelker offered to house James, with Gloria (who could live with a friend) welcome at any time to see her son. Toward the end of 1993, Kelker and his live-in girlfriend decided to move, but another youth football coach at the school, “Big” Frank Walker, extended his suburban Akron home to James. James credits both families for steadying his life and getting him back in school, and the saga between fourth and fifth grades has become one of the superstar’s favorite allegories. But more than just a motivational tale, James has taken his experience and molded it into a philosophy on what it takes to keep poor and stressed-out kids on the right track. That philosophy now exists in physical form with the I Promise School, a new campus that opened a month ago as part of the Akron Public Schools system. It debuted with 240 third- and fourth-graders who are struggling academically and largely from underprivileged families. The school will grow to include first through eighth grades by fall 2022, but the fundamental features of the program are already in place. School days are longer, running from 9 a.m. to 5 p.m., as is the school year (from July through May) in order to take pressure off working parents. Students receive free breakfast, lunch and snacks. There’s a new grading system in place for the kids, as well as “support circle” sessions each day to help students learn how to calm their emotions and talk through challenges. Parents, too, are given more feedback at school (in individualized meetings with advisors) and also offered help in the form of housing and job-placement services, GED classes and a food bank — all things that James’ mother, Gloria, could have benefitted from too. James is no stranger to charitable causes, given that he already worked with Akron Public Schools to set up the I Promise program and even pledged $41 million to give all eligible program students a free ride to college. But even for him, building a campus and a curriculum that pushes new ideas on schooling is a task unlike any he’s approached before. Doing so required more than James and his foundation — it required working within the Akron school system to build something not just innovative, but sustainable. This is where Nicole Hassan and a squad of veteran Akron Public Schools staffers stepped in, organizing half a dozen “design teams” last year to hash out every ambition they could bake into the DNA of I Promise School. The teams spent months debating features that today form a public school unlike any other in the country. 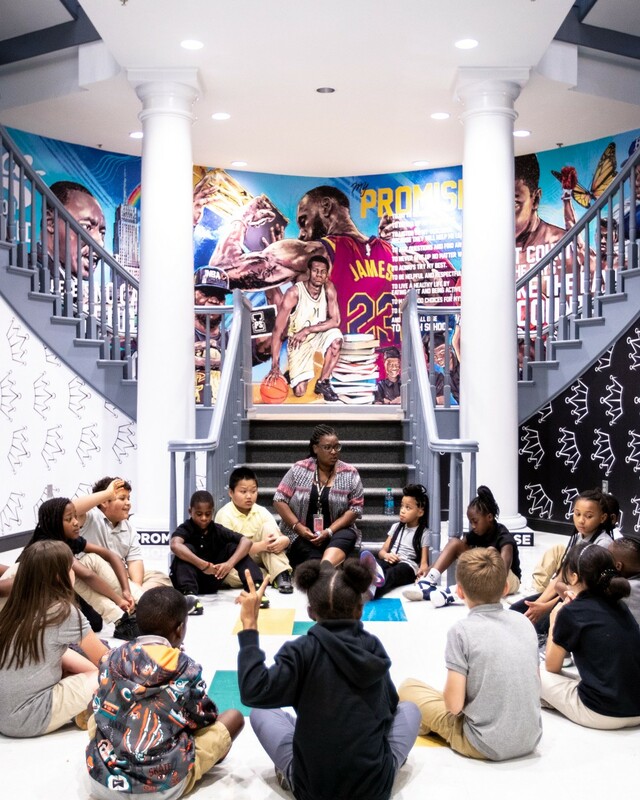 It’s supported in part by the LeBron James Family Foundation — it’s pledged $2 million a year to support the school’s growth — but otherwise funded by taxpayers as part of the Akron system. It’s an experiment in what a public institution can do to help kids in the most crucial aspect of their development into adulthood. “The hope is that this can become a model for more schools across the country in urban centers where young students need the most hope,” Hassan says. But how, exactly, did James and his advisors build such a school while working within the complexities of a major public school system? I spoke to Hassan for the answer, including details on how the curriculum of the school is designed, why it’s critical to “look at a student’s whole life” and how James is more than a shiny name attached to the project. First of all, what’s your background in education? This is my 18th year working with Akron Public Schools. I started as a classroom teacher, and was in the classroom teaching fifth and second grade for about 12 years. Then I moved to the district level as an instructional coach, where I was supporting teachers and students with curriculum and instructional practices. Then, the last two years, I’ve been specifically working with the LeBron James Family Foundation. I’m kind of coordinating and aligning their educational programming. Prior to the school, for six years, we had students entering LeBron’s I Promise program, which currently has students from third to 10th grade. So at that time, my role was to coordinate the programming they were providing through 40 different Akron public schools. We had a few students here, a few there, but we were dealing with 27 elementary schools in our district alone. So really, the discussion came up about whether we’d be more effective if we could house everyone in the program in one physical location. What was your initial impression when LeBron’s foundation came to you and began discussing this project? Even the fact that such a big name was attached — was that an advantage? I was extremely excited. Not just about LeBron, but the ideas they wanted to bring to the students, because their basic tenet is that we’re a family, and that we need to embrace kids where they’re at and help them get to where they need to go. In my opinion, one of the most important things educators must do is to truly love their students and deal with the whole child, not just their academic performance. Often, in urban districts, you have such a strong focus on academics because your test scores aren’t where they need to be. As for having LeBron on the team in a meaningful way, it really helps as far as bringing other people from the community in to back us up, offer partnerships and provide resources that other students have not had. Who was involved in shaping that early vision for the school’s master plan? When that conversation came up, my partner [Akron Public Schools Family Liason Keith Liechty] and I were tasked with creating six different design teams, composed of Akron Public Schools’ administrative team as well as teachers, educational experts, students, parents and community leaders, along with the foundation of course. For four months, the process was just to dream big. Anything that we knew as being innovative or out-of-the-box in education, we tried to put into a plan. We visited various schools across the country that were known for these best practices, as well as several conferences to learn more about emerging areas that we didn’t have enough info on. Were there certain aspects of this I Promise master plan that were immediate and obvious from the beginning? The major feature we looked at when we were traveling was trauma-informed education. I spent many, many years researching, reading and practicing trauma-informed strategies in my classroom and with other teachers, but I’d never seen a school that was considered to have a full trauma-informed program. How exactly do you implement that, and why is it so important for kids in the Akron school system? First, I should say that not all of our students in the building have experienced trauma. A trauma-informed curriculum is good for all students — they just have more benefits and resources to tap into. But what we find in urban districts, particularly, is that the prevalence of trauma in their lives is almost exponential compared to a suburban area. That trauma consists of anything from community violence, to domestic violence, to a natural disaster, to even something as small as a dog bite. So when we have to explain it to folks that don’t believe that trauma exists in students, we say it’s just like extreme stress. If you wake up every morning and you don’t know where you’re going to end up that night, or if you don’t have food in your house and you’re hungry when you get home, or if you’re alone because your mom works nights, all of these things create the stress. And a lot of our students experience that. That stress has a major impact on the student’s ability to learn, right? Why it’s so important to acknowledge this in the school setting is because the research says that when students are in this extreme state of stress, it actually changes the way their brain functions and processes information. So, if we aren’t doing something to transition students into the school, they aren’t going to be capable of learning because of the way their brain processes information. There’s a lot of research behind this also affecting behavior, and that’s what I think most people realize about trauma, is that when students have a tough background, or a tough home life, they misbehave. That’s not the only indicator. Actually, a larger percentage of students that have experienced trauma are introverted, quiet and subdued than they are at the extreme levels of behavior. What the constant is between all of them is they’re not processing information in their neo-cortex, so they aren’t able to retain, recall and problem-solve critically as well as they should. Hence the need to look beyond the classroom to the student’s home life?Right. And it extends further at I Promise because we also then extend that approach to the families with a variety of wraparound supports. We’re trying not just to change the academic outcome, but the social-emotional outcomes, which then create generational change within the community. What’s a key aspect of the school that you’re still feeling out and following closely now that we’re a month in? What we’re still hashing out is standard-based grading and mastery learning, which we went to several conferences to learn about. It’s a shift for the district because we’re the only school doing this. And it’s a shift for parents, too. Teachers are getting used to it more, where they’re not looking at giving letter grades of A-B-C-D but rather asking the question, “Have you mastered the standard?” And what smaller targets do you need to get there? It’s about conveying to the parent that your child is a year and a half behind, so they’re not going to get an A, but we’re making progress. We try to explain this different way of grading to parents who have lived their whole lives understanding the typical metric. There’s an adjustment process. When you think of a public school district, you think about a lot of standardization and a lot of rules on what a school can look like. How was a school with as many new ideas as I Promise even possible? Currently, Akron Public Schools has a few different specialty schools. We a have STEM middle school and high school. We have an Akron early college, we have the performing arts school. So Akron public schools has been familiar with the idea of doing, in a centralized location, something different with specialty schools. However, the ambition of the people behind this definitely is what made it happen. We came up against a lot of roadblocks just because of the systems in place within the public school system and in the teachers’ union and different things. But as we worked through each of these things, all of the administrative leaders were very collaborative and cooperative in helping us get what we want. And I’ve seen ripple effects of things that we’ve already started changing within the administrative levels in our district just because of the energy that the foundation and design teams brought to the table. The concept of holistically involving and assisting families is pretty crucial to the school’s stated mission. What help are you offering? We have a family resource wing of the building where we have the Akron-Canton Food Bank in-house, so families can come to the school to get staple foods to get them through ’til the next paycheck. As you continue down the hallway, we have our actual family resource center. Director Vicky McGee is essential to the program because she has a knack of building a relationship with every single person that walks in the door, regardless of how they come at her. Sometimes when families are frustrated, they have a lot of angst, but she’s able to break down barriers immediately. What she does then is complete what we call an “I Promise Family Plan,” and she identifies areas of need. But instead of just providing them with resources, she helps them set goals that are related to those needs, too. Our county has a vast network of agencies and resources, so Vicky sorts through all of that and funnels families directly to what they need. A lot of times she makes those phone calls right there in the meeting with the parents, so that they don’t have to leave and then not get it done. Right next door to Vicky is our “I Promise To Chase Your Dreams” room, and that’s where we provide GED classes on site, two days a week. The morning and evening classes are the first step toward a GED for a lot of our families. We also will be starting ESL classes here at the building in January. I know we talked about students’ trauma and how their experiences outside of the classroom can affect their performance in the classroom, but how does parental stress affect a kid’s education? You can think about Maslow’s hierarchy of needs for this idea. If the family is stressed about providing basic needs for their children, then they’re not able to attain greater purposes either as individuals. Then that personal stress ends up misdirected, sometimes at the students, because when you’re working multiple jobs or trying to find work but don’t have the right credentials or face other kinds of challenges, those are stressors that can build up. It also means that schooling isn’t on the forefront of their mind because they’re so busy attaining the other needs of their family. Can you walk me through the admission process, and what the demand for year one was like? There are so many people who have called that want to enroll their kids. We stick to the equation that was developed by the design team for admission, which is based on academic reading scores. They have to be scoring below the 25th percentile in reading, which is about a year-and-a-half to two years below grade level. So from that pool of eligible students, it’s a lottery system. If you didn’t make the lottery, there’s no other option. We had a set of twins that were separated, for example. But if we make that exception, we’ll have other people who will expect some exceptions. So we stick to our guns. By every account, LeBron was personally involved in this process. But how deep into the weeds did he get? He reflected on his own experiences as a student and thought about how the elements that helped him could be stronger and what areas could have been better for him. We started our design process with this major document that just listed different things that were important to LeBron and to the foundation team — it was for us educators to take and make it into an educational system. He says all the time that if every student could go to school and be loved every day, that in itself is going to change their perspective. LeBron gave the philosophy, and then we made it into practice. And he actually shows up in digital form around the school with video messages and other words of encouragement every day. What do the students make of that? If you were to stop any kid in the hallway, I think for sure they’d be the first to tell you that they think LeBron believes in them and that he expects them to work hard. Every morning they start the school day by saying “The Promise” that he helped develop, which goes through the tenets of working hard, dreaming big and doing their best every day. It’s a huge, huge motivator. What have you heard in terms of first impressions from parents now that the school has been open for more than a month? One of the biggest things that we’ve seen is parents saying how different their child is at home, how they’re excited to come to school instead of hard to pull out of bed. We started school a month before everyone else, and so we asked children to give up part of their summer and they didn’t fight it. They were excited to be there. We had a family event last night, and I spoke to one mom who said that for the last three years in school, they’ve been trying to get their daughter to be more confident and more outgoing because she has a lot more potential than she believes. And she said within a short period of time, she’s already seen a big difference with how she handles day-to-day stuff at home because she’s walking around with more self-assurance. I know the teachers love being here all the time too, but we for sure ask them to give more of themselves than in their previous job. The administration is cognizant of needing to make sure that they take care of the teachers so we don’t burn out. So, a lot of the things that the foundation has done is to support that. At the end of this month, they’re sending the entire staff and a guest for each to the symphony so that they can have a night out. We regularly have lunches provided and snacks and different things to help keep staff positive because it’s a hard job. But I also think if you were to stop any of them in the hallway, they wouldn’t want to be anywhere else. LeBron himself is a public school kid and felt passionately that I Promise should stay in that system. Why is it important to you that that’s the case? The biggest point is with it being public is that it’s something that can carry over across the country. Our mission is to be a nationally recognized model for urban education. The common idea is that it’s easier to do a charter school, or it’s easier to do private because you don’t have to work within the confines of a public school system. But then those schools are only available to certain students, whereas every community has a public school. I want the elements of I Promise to be the norm for our district and spread across the nation so that in Chicago, in Detroit and in other areas where students have a lot of trauma, they’re utilizing these practices as well. Of course, one of the things we’d love to see is that other communities help support such a school. A lot of our contributions have been from community partners beyond LeBron’s foundation. It’s important that LeBron’s a part of it, but he definitely couldn’t do it alone, and I think other communities could generate the same contribution. Honestly, if we believe that education is the way to create generational change and improve a community, then communities need to start supporting the school system in a real way.